Biotech Bonanza: The Next Leg Up for Biotech Stocks! The Biotechnology sector remains one of the top performing sectors this year with the benchmark Nasdaq Biotechnology Index of biotech stocks, as represented by ETF (IBB), gaining 17% in the first-half. The index though still remains ~29% down from its all-time high achieved in mid-2015. In comparison, the S&P 500 (SPY) was up 8%, and the Nasdaq Composite (QQQ) up 14%, in the first-half. In our timely article, Biotech’s Best Chance, and its follow-up Biotech’s Best Chance Gets Even Better, we had outlined a number of imminent reasons for a Biotech rally to ensue. The arguments remain compelling, particularly the emerging FDA focus, and support higher valuations ahead. The industry is benefitting from improving news sentiment as the “getting away with murder” kind of comments from the President are being gradually replaced with news on clinical successes, particularly in the new field of personalized medicine. The recent focus on the innovative Chimeric Antigen Receptor T-cell (CAR-T) therapy, as Novartis (NVS) edged closer to an FDA approval following a recommendation by the FDA’s advisory committee, has generated considerable positive coverage for the sector. The CAR-T therapy extracts healthy T-cells from a patient’s own immune system and after modifications to target cancer cells, reintroduces the T-Cells back into the patient. Other players pursuing success in CAR-T therapy include Kite Pharmaceuticals (KITE), Bluebird (BLUE), Juno (JUNO) and Cellectis SA (CLLS). Earlier this week, Vertex Pharmaceuticals (VRTX) disclosed impressive data on its Phase 1 and 2 trials for its triple combination regimen to treat cystic fibrosis. The strong efficacy, particularly in lung capacity, was remarkable and if the trial results are replicated in Phase 3 it can provide relief to 90% of the cystic fibrosis patients besides expanding into a significant multi-billion opportunity for the Company. A similarly ambitious combinations program is also being pursued by the partnership of Galapagos NV (GLPG) and AbbVie (ABBV). Making progress on some major, high-profile diseases, along with the absence of hostile tweets from the White House, has begun to improve the general perception around the biotech sector. The easing political pressure on the health care sector (XLV) has been instrumental in biotechnology’s recent strong performance. As mentioned in the earlier article, a draft of the Executive Order, expected to be issued over Summer, focuses on bringing drug prices down by principally streamlining the drug approval process. The industry’s much-disliked and feared scenario of a drug price negotiation with Centers for Medicaid and Medicare is not expected to be part of the price-reduction strategy, consequently easing the pressure the industry has faced since late last year. If this is how it eventually turns out, it will be an industry-friendly set of policies. By placing the Food and Drug Administration (FDA) at the center of its price-cutting effort, the administration is placing great responsibility on the agency to drive efficiencies, and in the process potentially transforming the drug approval process. This is a critical change and one that is expected to be highly favorable to the biotechnology industry for years to come with the promise of a new era of faster drug approvals, lower costs, and higher valuations. And we are at the beginning of this new paradigm. 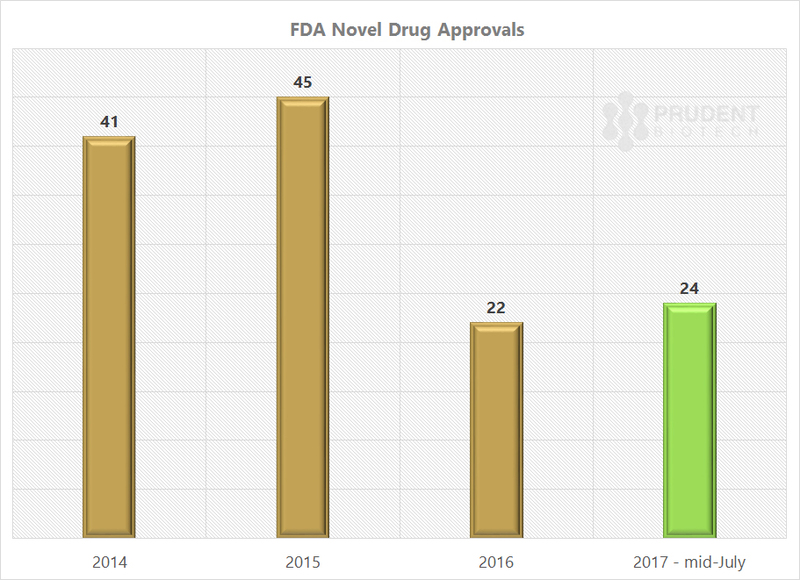 Things have already begun to head in the right direction with the FDA new drug approvals for 2017 ahead of the approvals for the entire 2016, with much of the momentum being built up prior to Gottlieb’s appointment. 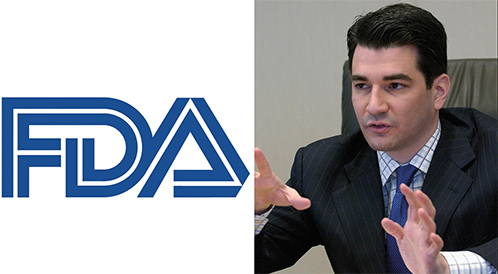 The FDA under Commissioner Scott Gottlieb has the mandate to speed up the drug approval process, and we should expect a further acceleration as the year progresses, and into 2018. In addition, there will be a growing push towards increasing generic competition for compounds with expired patents, to achieve lower prices. With the FDA now clearly focused on accelerating new therapies to market, the above-mentioned Novartis CAR-T program, CTL019, will now be precedent-setting as the FDA has to consider an approval for an innovative new therapy with solid data, but untested in advanced and broad clinical trials. In addition, a gene therapy program is also pushing for a milestone, the first approval of such a therapy, with Spark Therapeutics (ONCE) drug for the retinal disease, Luxturna. Furthermore, Gottlieb has clearly stated his desire to clear the backlog and response times. Late last month, the FDA announced a strategic plan to eliminate the existing Orphan Drug backlog of ~200 drugs within 90-days as well as responding to new requests for such a designation within 90-days of receipt of the application. In addition, the FDA Commissioner is embarking on a program to strengthen the recruitment effort to hire the appropriate clinical and scientific expertise to fill up the numerous positions, as mentioned in his blog post last week. A skill mismatch, based on evolving science, and open positions have hampered efforts at the agency to be more responsive. The initial focus will be on "PDUFA related positions in our drug and biologics programs." All the above suggests a new urgency to revamp FDA processes and places the biotechnology sector in a highly favorable position, which investors must neither ignore nor underestimate. The biotechnology sector is not as much earnings-driven as most other industries, but there is still a large cap biotech segment that is earnings-driven. The earnings season is expected to be relatively strong compared to prior quarters and, along with easing political pressure and clinical successes, is expected to maintain momentum in biotech stocks. Strong performances are expected from Bioverativ (BIVV), Exelis (EXEL), Incyte (INCY), Biogen (BIIB), Alexion (ALXN), Exact Sciences (EXAS) and Vertex (VRTX). At the same time, companies like Gilead (GILD), Amgen (AMGN), Celgene (CELG), Regeneron (REGN), and Ionis Pharmaceuticals (IONS) are expected to meet expectations. Broader market earnings, represented by the S&P 500 (SPY), are anticipated to grow +6.5%, as per Factset. There is a growing concern amongst the FOMC Governors about low inflation, and emerging evidence now points to a willingness to reconsider further rate increases based on data, rather than a pre-determined course. This is a positive for accommodative policy, keeping in mind that the Federal Reserve will most likely begin its balance sheet normalization program in September this year. The importance of this changing viewpoint cannot be emphasized enough and a detailed discussion along with its implications can be found in our last week's article, A Monetary Policy Reset. A continuing accommodative policy is a positive for the broader stock market and particularly the more speculative sectors, like Biotechnology. As we pointed out in our Biotech's Best Chance articles, M&A would be a great catalyst but is highly unpredictable and not essential for the sector to break out, in light of other compelling drivers. That proved correct as Biotechnology indexes broke through their long-term resistance last month to record new 52-week highs. We continue to believe M&A remains a strong argument, and can be a great booster for sector valuations, but is not essential for further biotech gains. Successes in new fields like immuno-oncology, gene editing, personalized medicine, and artificial intelligence are elevating the interest in the biotech sector. 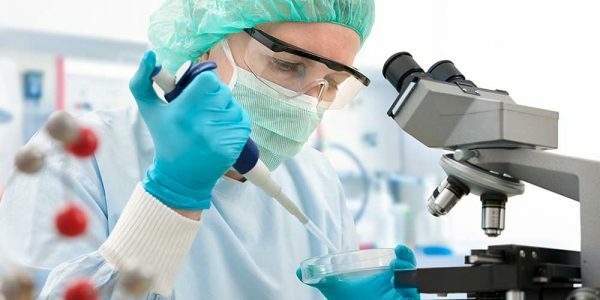 Interest in biotech-pharma is at an all time high from the standpoint of healthcare venture fundraising, which is on pace to exceed $6 billion for the year and set a record, as per Silicon Valley Bank health care report. The same report highlights that Oncology and Orphan drugs are attracting the most VC and corporate investments. Valuations are high and will only get higher. It's a seller's market. Much of the M&A focus has been on smaller deal sizes. Indeed Novartis CEO Joe Jimenez on last week's earnings call mentioned the market for mid-size bolt-ons, $2 to $5 billion, is a sweet spot for the company but valuations are too high, and the company will look at smaller deals and earlier-stage assets. We would like to note that FDA's focus on clearing the Orphan Drug backlog and speeding up the drug approval process will definitely be a positive for M&A transactions in the second-half. We strongly believe that a more efficient FDA will benefit smaller and mid-cap biotech companies more, compared to larger ones. There can be a flurry of relatively smaller deals in the $1 to $3 billion range, as focused and promising, but speculative, assets are acquired for valuation levels that do not create a potentially major headache. After all, Pfizer (PFE) after acquiring Medivation for ~$14 billion is now trying to understand and explain the declining sales of Xtandi. This should make the Company somewhat reticent in pursuing major transactions, and the probability of Pfizer doing a major deal ($5-$15 billion) in 2017 is quite low. At the same time, Gilead (GILD) has been urged to acquire a large cap company, like Incyte (INCY), Vertex, or Bristol-Myers Squibb (BMY), amongst others, as it continues its transformation from an antiviral to a broader focused therapeutic company, but remains cautious on how to deploy its large cash stockpile. In our opinion, FDA will now become the catalyst that both enhances valuations of Biotech stocks on its next leg-up, as well as spur smaller M&A transactions. In a double-win for the pharmaceuticals and biotechnology industry, an expected business-friendly health care policy and more efficient FDA drug approval processes, have set the stage for higher biotech valuations for the remainder of the year. This is a transformative change for the biotechnology sector, which has been plagued by an uncertain healthcare policy, but now stands to benefit from policy clarity and an FDA focused on faster drug-approvals. At this point, we believe the biggest risk to the sector is more of a market risk associated with a tumultuous Presidency than something sector-specific. We believe investors should maintain their exposure to biotech stocks, and a portfolio of small to mid-cap companies can be quite attractively positioned for strong gains. Some of the promising companies we like and have mentioned in the past include, Regeneron (NASDAQ:REGN), Exact Sciences (NASDAQ:EXAS), Vertex Pharmaceuticals (NASDAQ:VRTX), Celgene (NASDAQ:CELG), Exelis (EXEL), Puma Biotechnology (PBYI), Supernus Pharmaceuticals (NASDAQ:SUPN), Tesaro (NASDAQ:TSRO), Clovis Oncology (CLVS), Axovant Sciences (NYSE:AXON), Incyte, Kite Pharmaceuticals (NASDAQ:KITE), Bluebird (NASDAQ:BLUE), Aeri Pharmaceuticals (NASDAQ:AERI), Novocure (NASDAQ:NVCR), Foundation Medicine (NASDAQ:FMI), Esperion Therapeutics (ESPR), Akebia Therapeutics (NASDAQ:AKBA), Loxo Therapeutics (NASDAQ:LOXO), Portola Pharmaceuticals (PTLA), Amicus Therapeutics (FOLD), Arena Pharmaceuticals (ARNA), Gycomimetics (NASDAQ:GLYC), and TG Therapeutics (NASDAQ:TGTX). Portfolio exposure can also be acquired through biotech sector ETFs like IBB and XBI, including leveraged ETF (LABU). The article was first submitted for publication on Seeking Alpha on July 23 and can be viewed there as well.